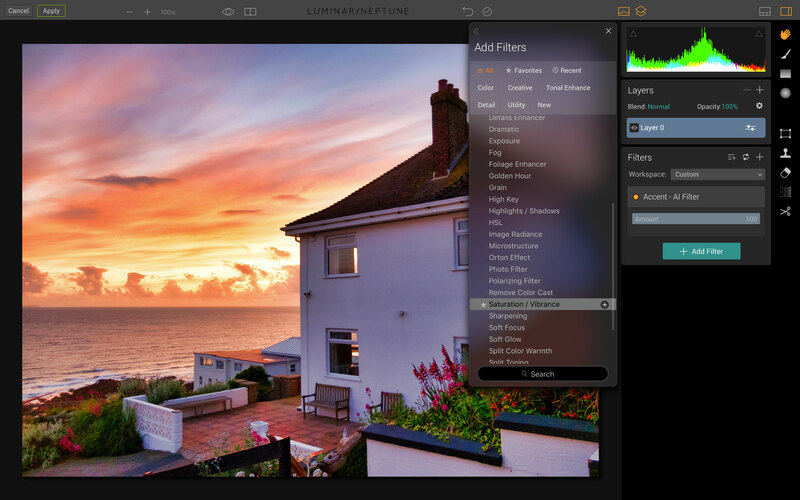 The MacPhun Luminar 1.2 Neptune update brings a bunch of new and interesting tools, and one of them is the AI Accent filter. AI stands for ‘artificial intelligence’, which is used to analyse different parts of the picture for objects, structure, colour, light and dark tones and more. When you drag the slider it intelligently enhances all these different areas according to what it thinks they’re lacking. You need to start from a clear workspace like we’ve done – just choose Clear from the Workspace menu, then click the + Add Filter button. The list of filters opens up and Accent – AI Filter is right at the top. Yup, that’s it. There are no additional controls. The AI routines are automatic and non-adjustable, but that’s OK because you can adjust the slider position to get just the right degree of enhancement. We’ve stopped at 75 – if you go right up to 100 the saturation levels become pretty hard to take. There’s a button for this on the top toolbar and it splits the screen vertically into before and after images. You can drag the divider in the centre to ‘wipe’ across the picture to see how different areas have been enhanced. MacPhun only describes the filter’s action in broad terms, but we can see what it’s done to this shot. The bright sky has been darkened and given a lot more structure to really bring out the clouds and the colours. The shadows, meanwhile, have been lifted and brightened – the red blooms on the right side of the picture are now bright and clear, whereas before they were lost in darkness. This is what we get if we push the Accent – AI Filter right up to maximum. The picture looks mostly OK except that it’s too saturated, but we can fix that by adding a Saturation/Vibrance filter. Just bringing the saturation down a little makes a big difference. We still get the nice highlight and shadow tonal adjustments and increased structure, but the colours are now a little more realistic. This last step is by no means essential, but it does improve the atmosphere and composition of this sunset shot. It’s the Vignette filter, new and enhanced in Luminar 1.2 ‘Neptune’. 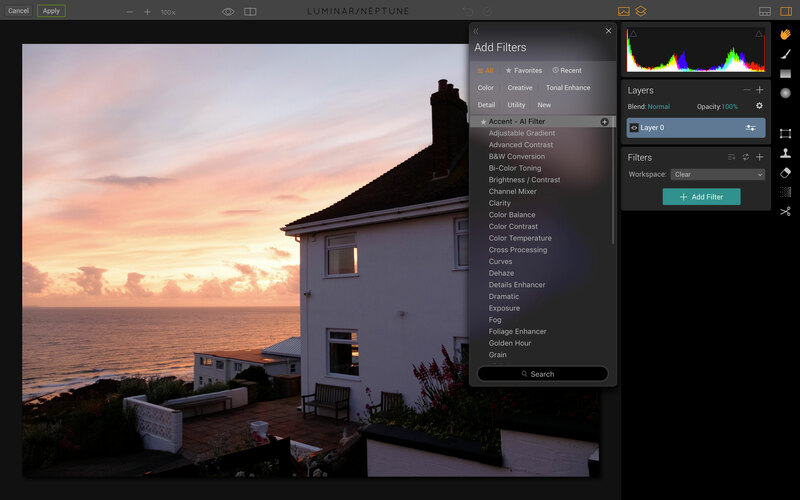 It also shows how easy it is to build up image effects by combining filters – Luminar adjustments can be just as simple, or just as sophisticated as you want them to be. Just finished my first processing of 40 pics with Lum. Neptune PC Beta. It really was the first FUN I have had with post processing. However, I am a stickler with straight lines, correcting parallax, optical/lens correction. No matter how beautiful and well corrected the image, if there are those “optical” flaws they grab my eye. 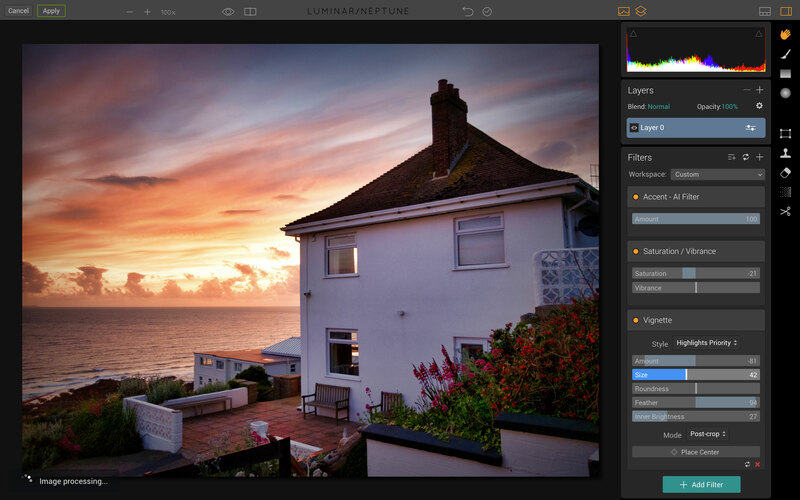 In your pics discussing Luminar/Neptune all your pics are exceptionally well corrected. Does Luminar/Neptune/for Mac have that feature – which Lightroom does so nicely?? 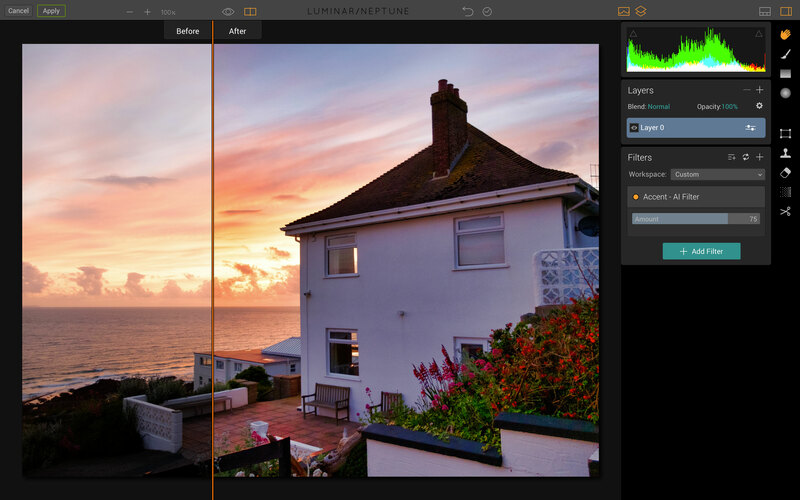 With plans to shift over to Luminar for PC I hope Macphun will match Lightroom in lens support. Hey Don, I’m obsessed by optical corrections too, so I’m glad to meet a fellow stickler! 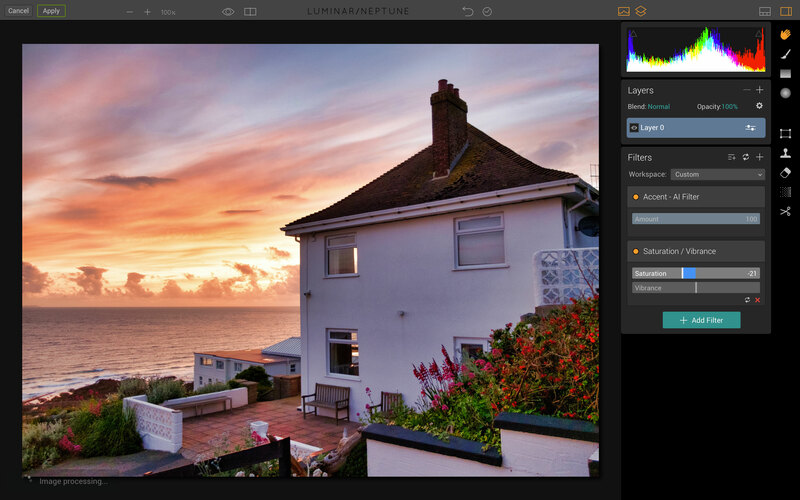 I’ve posted a few articles about Luminar so I’m not too sure which you’re referring to. In general, though, I will often do optical corrections in Lightroom or some other software first before editing images in Luminar. Either that, or I shoot images carefully with the camera level to avoid converging verticals (not always possible, I know). Hopefully, one day MacPhun will add optical corrections to Luminar. In the meantime, you and I will have to use some other software that can do this first. 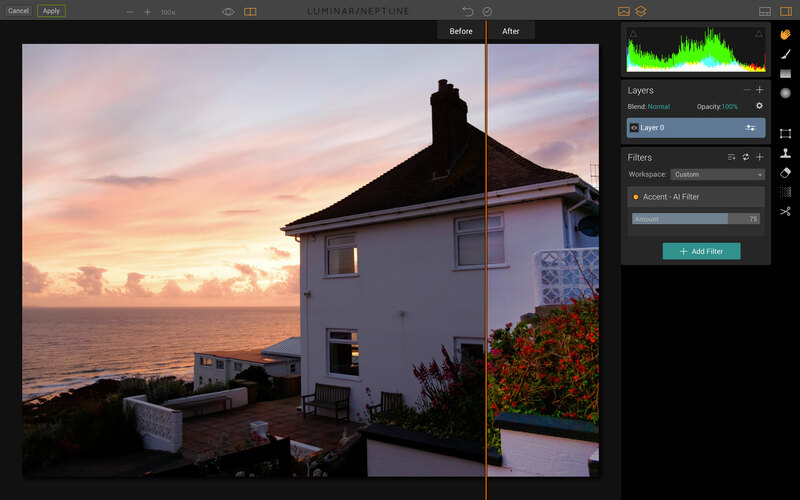 Glad you’re having fun with Luminar – if you’re not having fun, what’s the point?